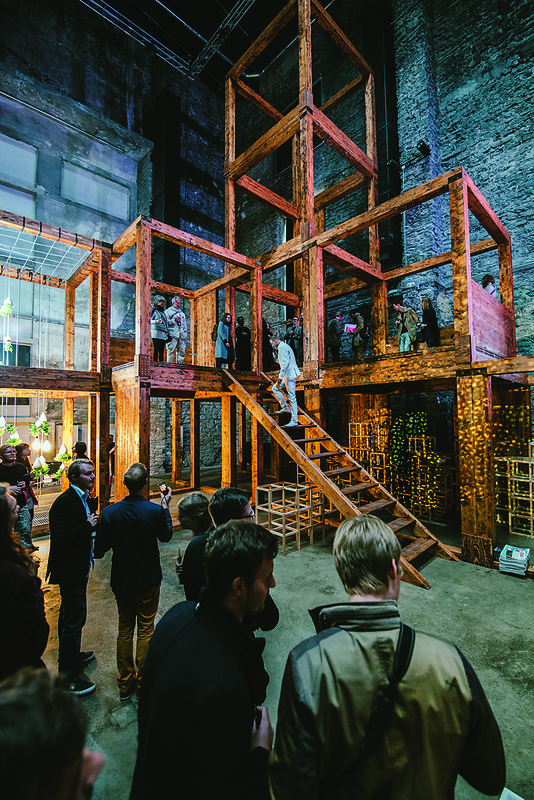 The 4th Tallinn Architecture Biennial (TAB) was the biggest architecture event in the region last year. Every second year, a curator is chosen for the biennial through an open call. The openness of the biennial’s competition format and the courageousness of the jury have always resulted in a fresh and forward-looking perspective on contemporary architecture via the prism of Tallinn. The focus of the biennial is the curator’s exhibition and closely connected symposium. 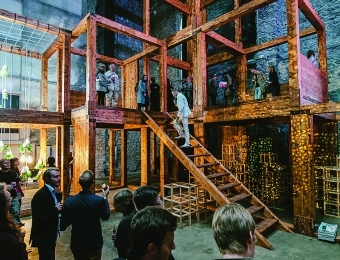 Conceptualisations of Tallinn within the framework of the biennial have proven time and again to be highlights. 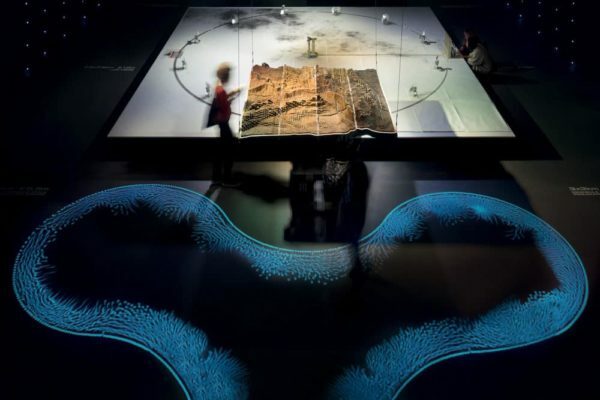 For example, the high point of TAB 2013, with the theme Recycling Socialism, was a lecture given by the Italian architect Pier Vittorio Aureli, a member of the Dogma collective, and Dogma’s project, which was included in the curator’s exhibition. For the work Live Forever: The Return of the Factory, Dogma took as their starting point the waiting pavilion for regional trains at the Baltic Station (Baltijaam) railway station in Tallinn. Within the framework of the Recycling Socialism theme, Dogma’s project tried to restore the social dimension of architecture by proposing a building for 1,600 people, free of charge, so people could ‘pay’ the city back by informally passing on their skills and organising workshops and cultural events. 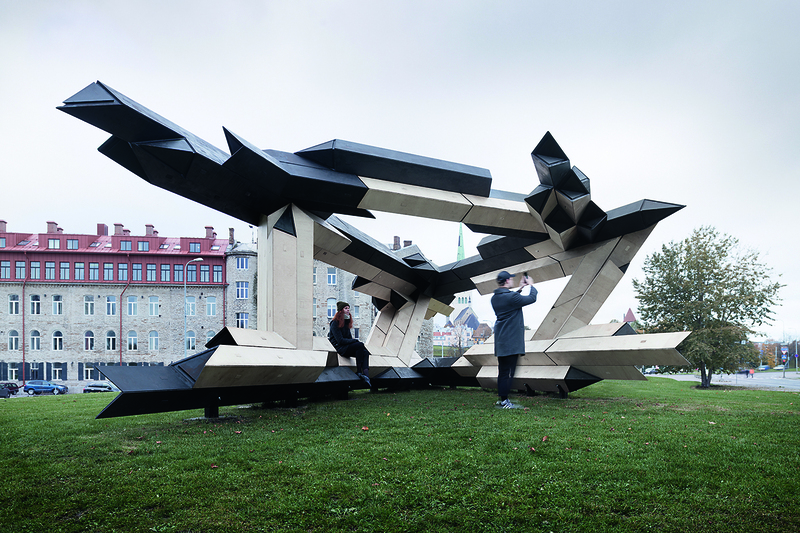 Last autumn, the same waiting pavilion at the Baltic Station (Baltijaam) that inspired Dogma’s project was the location for the TAB 17 symposium, with the theme bioTallinn, and one of the most outstanding presentations there was given by Gilles Retsin, the winner of the installation competition, whose lecture Digital Building Blocks returned to the foundation elements of modernist architecture; as one of the pioneers of contemporary parametric architecture, he was playfully critical by calling the style and its practices ‘technological mannerism’. In front of the Museum of Estonian Architecture, Gilles Retsin, inspired by Le Corbusier’s Maison Domino, erected an installation of universal building blocks that could be combined to create various structures. Last autumn, for the second time, a TAB-curated exhibition took place at the Museum of Architecture, but it hasn’t always been like this. In 2011, the main exhibition of the first biennial, with the theme Landscape Urbanism, took place at the Kadriorg Art Museum, within the permanent exhibition and in the surrounding park. The works for the 11 Flirts exhibition were created or chosen to thematically or temporally interact with the art pieces displayed in different rooms or to continue the theme of the room in a present-day key. TAB is always looking for new venues and exploring the surrounding spatial environments with its events by creating modern spatial meaning and new connections between the exhibited works and their context. Within the framework of the biennial, a Tallinn vision competition is organised with the objective of taking the theme conceptualised by the curator to a wider audience and looking for solutions to some specific problem in the Tallinn urban space. 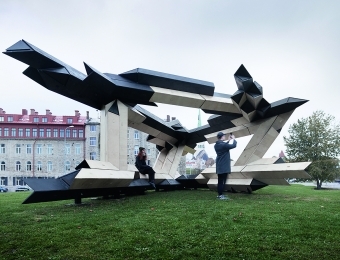 The main theme of TAB 2015 was Self-Driven City, and a vision competition was held for the most central spot of Tallinn, Viru Square, under the title Epicentre of Tallinn. In the long line of envisioning Viru Square, the winning entries of the vision competition provided valuable input and impetus to a process that has to date become the most important remodelling project in the Tallinn city centre, titled Main Street. In addition to the symposium, main exhibition and vision competition, curated by the main curator, the TAB programme also holds an installation competition and exhibition of architecture schools, which is organised by assistant curators. For the schools’ exhibition, students from all over the world travel to Tallinn for one week to present and compare their studio projects from the past year, and to discuss architecture and its potential developments. Representatives of the schools participate in thematic round-table discussions and workshops. The main programme of TAB contains just a small fraction of the plethora of architecture events concentrated at the beginning of autumn. The centre of the biennial is the TAB Club, which has an open stage and runs daily throughout the biennial. The mornings are filled with thematic excursions and the evenings end with special screening programmes at a cinema. Exhibition openings and satellite events are held during the breaks in the main programme. The Estonian Centre of Architecture, who organises the Tallinn Architecture Biennale, has announced an open call for the TAB 2019 curator. The jury is looking for architecture curators to propose their visions of conceptualising contemporary architecture at the Tallinn Architecture Biennial. The submission date is in April 2018. We invite all architecture enthusiasts to come to Tallinn in September of next year and be part of the next chapter of this Nordic architecture festival. Villem Tomiste (b.1975) is an architect at his practice Stuudio Tallinn and is the Head of the Committee for the Tallinn Architecture Biennale.